In the powerful mystery from Julia Keller, a murder investigation leads West Virginia prosecuting attorney Bell Elkins to the shattering truth about her own past. 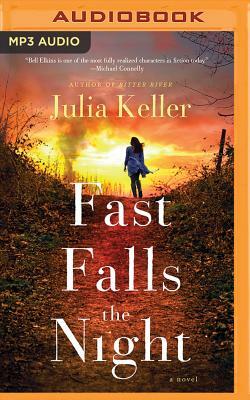 Based on a real-life event, Pulitzer Prize-winner Julia Keller's Bell Elkins novel Fast Falls the Night takes place in a single 24-hour period, unfurling against the backdrop of a shattering personal revelation that will change Bell's life forever. The first drug overdose comes just after midnight, when a young woman dies on the dirty floor of a gas station bathroom. To the people of the small town of Acker's Gap, West Virginia, it is just another tragedy. It is sad―but these days, depressingly familiar. Prosecutor Bell Elkins soon realizes that her Appalachian hometown is facing its starkest challenge yet: a day of constant heroin overdoses from a batch tainted with a lethal tranquilizer. While the clock ticks and the bodies fall, Bell and her colleagues desperately track the source of the deadly drug―and engage in fierce debates over the wisdom of expending precious resources to save the lives of self-destructive addicts.